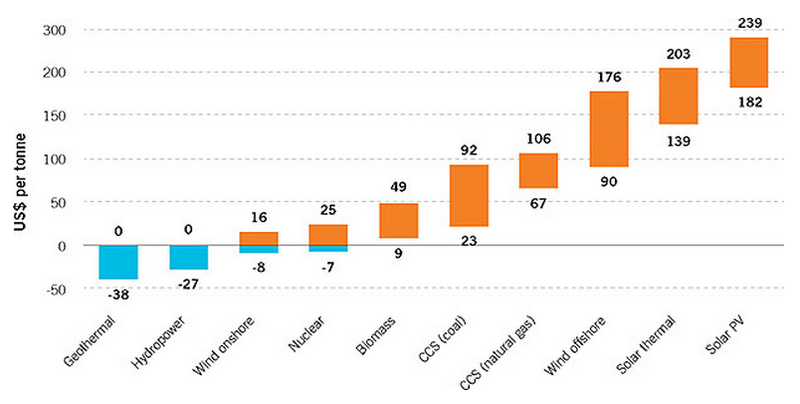 CCS is often neglected as a low-carbon energy option next to renewables and nuclear. Despite its lack of ideological attractiveness, CCS has competitive economics and very broad deployment possibilities. CCS is very well suited to the likely climate change policy scenario of delayed/ineffective proactive action followed by rapid reactive decarbonization. This three-part article will outline the primary reasons why CO2 capture and storage (CCS) should form an important part of the global energy mix over the 21st century. In contrast to most advocacy pieces, however, no arguments for technology-forcing policies such as feed-in tariffs or deployment mandates will be presented. Instead, the following articles will strive only to illustrate why CCS will do well in what I view to be the most likely future climate change policy development scenario: delayed/ineffective proactive action followed by a somewhat desperate reactive scramble towards rapid decarbonization. The only policy action advocated will be continuation of the funding support necessary to ensure the commercial readiness of efficient second generation CCS technology by the time the reactive climate change mitigation scramble commences. Most people regularly participating in the energy and climate discussion will probably agree that CCS is something of a neglected child in the clean energy family. It does not have the great ideological appeal of renewable energy or the great fundamental potential of nuclear. In fact, most people just view it as a more expensive version of the same old dirty fossil fuels that still power close to 90% of our society. That is why you will find countless renewable energy enthusiasts, a healthy number of nuclear enthusiasts, but almost no CCS enthusiasts. To try and bring some objective balance to the discussion, this article will make the basic case for CCS. But first, if you do not agree with the scientific consensus that climate change is 1) real, 2) caused primarily by anthropogenic greenhouse gas emissions and 3) potentially devastating in the long run, you are wasting your time with this article. If climate change is not a factor, CCS makes no sense whatsoever. As shown below, the economics of currently commercially available CCS technology compares favourably with other low-carbon energy technologies. For example, a CO2 price of about $40/ton will be necessary to make CCS economically feasible for a significant number of coal plants. Nuclear and onshore wind are the only highly scalable technologies capable of abating CO2 at lower costs. However, as discussed previously, it is highly misleading to directly compare intermittent renewable energy such as wind to dispatchable energy such as coal with CCS. The cost of CCS also depends greatly on the type of process involved. Capturing CO2 from gas-fired power plants is expensive because the CO2 in the flue gas of a gas plant is very dilute. The situation becomes better for coal, but there are many industrial processes that yield flue-gas streams containing higher concentrations of CO2 (thereby allowing for cheaper CO2 capture). 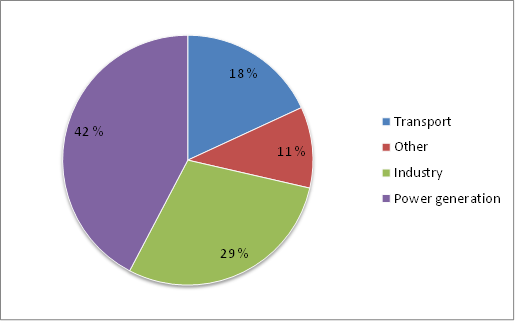 In fact, the IEA sees about half of the CCS deployment up to 2050 happening in industries other than power production. In addition, there are also mechanisms for the profitable use of pure CO2 such as enhanced oil recovery and various industrial applications. 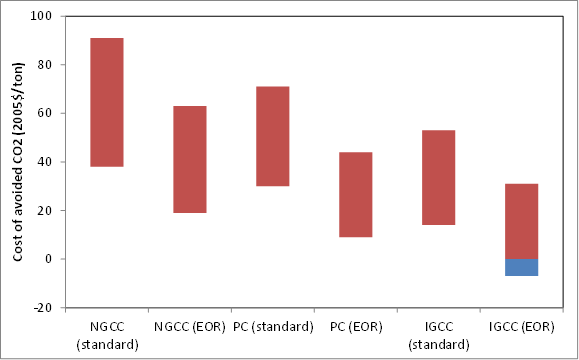 The figure below shows the impact of enhanced oil recovery (EOR) on three different power production technologies: natural gas combined cycle (NGCC), pulverized coal (PC) and integrated gasification combined cycle (IGCC). Finally, just like proponents of other clean energy technologies will undoubtedly claim that technology will yield very impressive price drops in the not-too-distant future, this claim can also be made for CCS. Second generation CO2 capture technology currently in the demonstration stage promises concentrated and compressed CO2 streams for as little as $10/ton in new plants and $30/ton in retrofits. 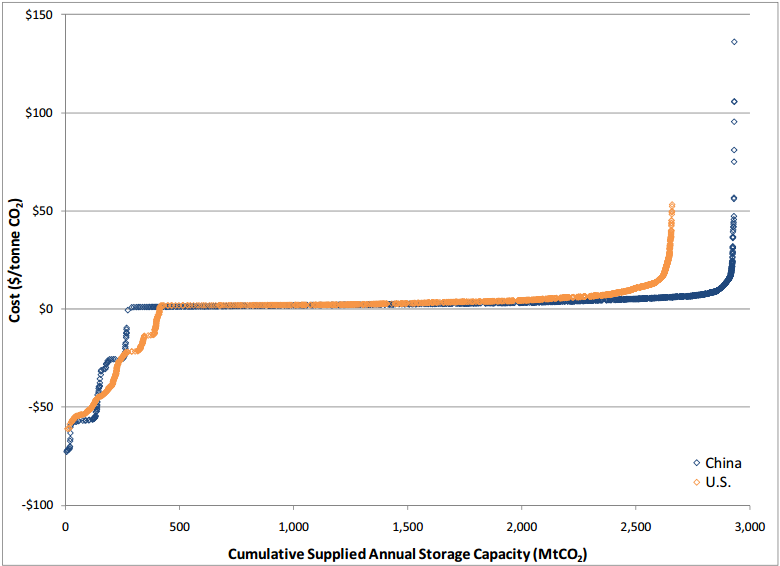 CO2 transport and storage are typically smaller components of the total cost and will initially have negative costs due to CO2 utilization (i.e. EOR). The graph below shows that the US and China can store about 800 Mt of CO2 per year at negative prices – about 5% of total emissions. In fact, a broad deployment of currently available commercial CO2 capture technology is not recommended because it is still rather inefficient (large energy penalty) and potentially hazardous (amine emissions). A good policy recommendation would therefore be to actively support demonstration projects of second generation capture technology as well as integrated projects demonstrating the full CCS value chain with the sole purpose of ensuring commercial readiness early in the next decade when the first meaningful technology-neutral CO2 abatement policy is expected. When it comes to effective CO2 abatement, CCS has a number of important advantages over nuclear and renewables. Firstly, CCS is the only possible option for meaningful abatements from industry in the medium term. As shown below, industry is responsible for almost 30% of our total energy consumption, making this a very important advantage. CCS also has some attractive advantages when it comes to the sector consuming the most primary energy (power production). The most important of these is the ability to retrofit existing plants. Power plants typically have very long operational lifetimes (there is a good deal of 50-year-old plants still in operation today) and, without CCS, we have no way of abating CO2 emissions from these existing plants. This is a serious problem because about 1400 GW of new coal-fired power plants is currently being planned to support rapid economic growth in the developing world – enough capacity to lock in about a decade’s worth of CO2 emissions at current rates. When it comes to new power plants, Chemical Looping Combustion technology capable of very high CO2 capture efficiencies with almost no energy penalty will also be able to stand its ground in an open market with a fair price on CO2. As outlined in previous posts, there are serious question marks about the prospects of solar and wind energy beyond penetration levels of about 10% where intermittency becomes a serious concern. Nuclear, on the other hand, will be able to compete head-to-head with new CCS and it will be very interesting to see how this competition pans out. Another interesting prospect is biomatter power plants with CCS. This technology arguably does not have a very large total technical potential, but can potentially deliver economically viable carbon-negative power. Lastly, we come to transport – the sector where CO2 abatement will probably be the most challenging. Many people still entertain the fantasy of an entire fleet of electric or hydrogen vehicles powered exclusively by renewable energy, but the chance of this happening within the timeframes specified by climate science is essentially 0%. Biofuels offer another option, but have a limited total technical potential and CO2 emissions comparable to that of gasoline (due to the large amount of fossil fuels required in the production process and indirect land-use change impacts). CCS can also play a role by producing low-carbon fuels (e.g. hydrogen or ammonia) from fossil fuels, but this is also a longer-term proposition. We can therefore count ourselves lucky that transport represents only 18% of the total primary energy consumption and still has lots of headroom for efficiency improvements. We humans are very good at postponing potentially unpleasant responsibilities for as long as possible before finally doing what needs to be done and it appears unlikely that climate change mitigation will be any different. As shown below, all mainstream energy roadmaps (IEA, BP & the EIA) project CO2 pathways that result in long-term atmospheric concentrations in excess of 650 ppm – a scenario which may very well trigger a range of potentially catastrophic positive feedback loops. 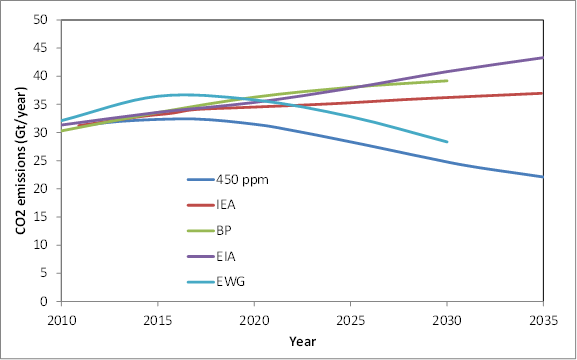 Even the peak-oil scenario considered by the Energy Watch Group (EWG) significantly overshoots the 450 ppm pathway. If economic growth can be maintained against headwinds such as rising energy costs, excessive debt, aging populations and rising inequality, I have to agree that such a runaway climate change scenario appears to have an uncomfortably high likelihood of actually playing out. Indeed, if climate science is correct, it is quite probable that we will reach a point within the next decade or so where the average man on the street starts to experience direct and clearly attributable negative effects from climate change. This will result in a marked increase in the public willingness to pay for deep and rapid CO2 cuts. If this scenario comes to pass, it is quite possible that CCS emerges as the primary CO2 abatement strategy, primarily due to the ability to abate emissions from industry and existing power plants. Nuclear and renewables will also play a role, but will be restricted to new power plants (where CCS will also be an important player). In short, if the world ever decides to limit atmospheric CO2 concentrations to 450 ppm or even 550 ppm, I can see no viable path which does not involve lots and lots of CCS. Yes, CCS may not be the sexiest energy technology out there, but it may very well be our best chance at preventing very serious long-term climate change damages. The next article will take a closer look at the likely behaviour of CCS in the strong technology-neutral CO2 abatement policy environment that should emerge under a global push for rapid decarbonization starting early in the next decade.